"Rocket Engines and Spacedrives", p. 36. Rocket engines are reaction engines that do not require air or oxygen to operate. They can be used for propulsion by aircraft, spacecraft, watercraft or underwater vehicles, as well as by ground vehicles that are equipped with skid or wheels subassemblies. There are numerous types of rocket engines, from simple solid fuel rockets to antimatter drives. Like jet engines, they are rated for pounds of motive thrust. A vehicle can have multiple rocket engines, and can use more than one type. Many of the TL9+ rocket engines are unlikely to be used if reactionless thrusters are available (p. 38); they are included for cultures or backgrounds where this technology does not exist. Solid Fuel Chemical Rockets (TL3): These are the simplest and earliest type of chemical rockets, in which the fuel is a solid (or putty) at ordinary temperatures. Such rockets have no need for fuel tanks or moving parts because the casing that holds the fuel is also the combustion chamber; a solid fuel rocket can be stored with fuel, and launched on a moment's notice. However, once a solid fuel rocket is started (unlike all other types of rocket), it cannot be shut down. A solid fuel rocket cannot be quickly refuelled – replacement of the solid fuel core takes several hours at a specialized repair shop, and costs 20% of the rocket's cost. This means that on manned vehicles, solid fuel rockets are best used as "boosters" rather than as the main propulsion system. Liquid-Fuel Chemical Rockets (TL6): These are rocket engines that burn a mixture of fuel and oxidizer, and expel the resulting hot gas exhaust to create thrust. Liquid-fuel rocket engines are quite light-weight, but they are extremely fuel-thirsty. Metal Oxide Rockets (MOX) (TL8): burn a slurry of metal powder in liquid oxygen. The performance is substantially lower than other types but they are sometimes used because fuel can be obtained by processing asteroids or lunar rocks. Ion Drives (late TL7):These are very low thrust electrical-acceleration propulsion systems that convert reaction mass into a stream of ions (charged atoms or molecules), which acts as a high velocity exhaust. An ion drive is extremely fuel-efficient, but huge amounts of power are needed to generate high thrust. Ion drives are not practical for taking off from a planet that has any significant gravity, but are better than chemical rockets for long, slow interplanetary voyages. Fission Rockets (late TL7): These utilize a built-in fission reactor optimized to heat reaction mass and expel it to produce thrust. They are heavy and expensive, but offer more thrust than ion drives. Their exhaust is somewhat radioactive. Fusion Rockets (TL9): These rockets incorporate an integral fusion reactor that heats reaction mass and expels it to produce thrust. The disadvantage is a very hot (and somewhat radioactive) exhaust. The optimized fusion rocket is designed for fuel efficiency at the expense of greater weight. Antimatter Thermal Rocket (TL9): This rocket mixes minute quantities of antimatter with far larger amounts of normal fuel to generate heat and produce an extremely energetic exhaust. The antimatter rocket is far easier to build (even at low TLs) than an antimatter power plant – the only limitation is that antimatter is extremely expensive at TL9. See Antimatter Fuel Bays (p. 90) for rules covering antimatter storage and failsafes. Antimatter Pion Rockets (TL9): A much more sophisticated space drive, this system mixes an equal quantity of matter and antimatter whose mutual annihilation generates energy. Part of this is in the form of pion particles, which are directed by magnetic fields rearward to provide thrust. The antimatter drive's main advantage is that it requires very little fuel and as such can accelerate for a long time, gradually building up to a very high velocity. Its disadvantage is that the exhaust is an intense plume of gamma rays and other radiation thousands of miles long! Antimatter pion rockets usually have some form of secondary drive for use when maneuvering in close proximity to other ships or space stations. Rocket engines are rated for their pounds of motive thrust. The more thrust a vehicle has, the faster it will move and accelerate. As with jet engines, vehicles may have more than one rocket engine for added safety; each is built individually, but their thrust will add together. Decide what type of engine the vehicle will use, how many it will have, and what each engine's motive thrust will be. For each engine the vehicle has, decide on its location and calculate its statistics as shown below. Exception: for solid fuel rockets, see p. 37. Location: The engine may be placed in the body, wing, pod, superstructure, or leg. Weight: The table shows the weight of the propulsion system (in pounds) depending on motive thrust and type. Volume: To find the volume, divide the weight by 50. Cost: To find the cost of the propulsion system, multiply the weight by $25 if liquid fuel rocket, or by $50 (any other system). Power: This is the power consumption per pound of thrust. Systems with 0 power consumption usually convert their fuel into energy, or in the case of a fission or fusion systems, are self-contained reactors optimized for propulsion. "Exotic Power Plants", p. 86. These power plants are primarily intended for use in fantasy, science fantasy, supers or horror games. Bioconvertors are bio-mechanical machines living inside the vehicle, eating food and producing bioelectrical or mechanical energy. They generate energy using food and atmospheric oxygen, and have a "mouth" into which water and food (anything biological) must be placed. All bioconvertors require 1 gallon of water per kW of output per day. Herbivore bioconvertors also eat ten pounds per day of any plant material per kW. Carnivore bioconvertors require two pounds of meat per day per kW. Omnivore bioconvertors require either meat or plant material. Finally, the Vampire bioconvertor requires 1 gallon of blood per kW per day. (An average human body has 1.5 gallons of blood.) It would require TL10 genetic engineering to build them, but wizards or alien cultures with advanced biotechnology might create them at much lower TLs, perhaps by breeding exotic animals. Soulburner is a generic term for a necromantic machine fuelled by life-force. It does not use normal fuel. Instead, an intelligent, sentient being must be placed within it. A soulburner's victim loses HT every 10 hours equal to the power output of the soulburner in kW. For example, a person placed within a 30 kW soulburner loses 30 HT every 10 hours, or 3 HT per hour. When a victim dies, he must be replaced if the power plant is to continue operation. Soulburners do not function in no-mana areas. A vehicular soulburner can be created by a TL2+ mage who knows the Enchant, Summon Demon and Steal HT spells; the Soulburner requires 600 energy to create per kW of power output. Damage caused by a soulburner heals at the normal healing rate. Regeneration, medicine or Healing spells do not speed recovery. Air-Golems (p. M70) can be used to drive muscle engines (p. 82). Each air golem is the equivalent of a ST 15 person, thus generating 0.3 kW of power. Elemental Furnaces (also called "infernal combustion engines") are magical steam engines using bound fire and air (for combustion) elementals. An elemental furnace functions like a TL5 steam engine, except that it can be built by any TL4 blacksmith working with a mage and requires no fuel. It requires a mage with the Fireproof, Air Golem, Control and Summon Fire Elemental and Control and Summon Air Elemental spells to create it, costing 300 energy per kW of power output. Also, any ordinary, TL5+ steam engine may be "elemental-enhanced" with a bound fire elemental to provide extra control. The air spells are not needed and energy cost is halved; elemental enhancement adds 100% to the engine's power output. Mana Engines are technomagic devices that gather ambient magical energy (in the same way a mana organ does in a magical creature) and transform it into electrical power. They do not require fuel, but do not function in no-mana zones. To create a mana engine requires a variant of the Powerstone spell cast on a rune-carved copper or silver metal sphere or block, which then produces a controllable amount of electrical power. The energy cost is 100 per kW of power output. The spell's prerequisite is the Power spell. Location: These power plants can go in the body, pods, or wings. Weight: Calculate the weight of the power plant as shown on the table above, based on output. Note that there are two columns, one for power plants with outputs under 5 kW, the other for larger power plants. A "no" in the "under 5 kW" column means a power plant cannot be built with less than 5 kW output. Volume: Divide weight by 50 to find volume in cf. * Minimum cost is $1,000, regardless of weight. ** Minimum cost is $4,000, regardless of weight. The costs listed for magical power plants do not include the costs of the various enchantments, since these will vary depending on how common magic is. In a "common magic" setting (see GURPS Magic), add an additional $25 per energy point to the cost of the power plant. Fuel Usage: Most exotic power plants do not require fuel. Bioconvertors devour water and solid food, while soulburners devour life force. "Main Battle Tank" description, p. 141. This is a modern, Western-design main battle tank like the German Leopard II or the U.S. Army's M1 Abrams. Subassemblies: Tracks, turret (full rotation, on body), two open mounts (#1 and #2, limited rotation, on turret). Body Features: Slope on body: front 60 degrees. Slope on turret: front 60 degrees, right 30 degrees, left 30 degrees. Propulsion: Tracked drivetrain with 1,100 kW motive power (HP 125, 1,100 kW). Weaponry: TL7 120mm tank gun (TuF, HP 125). 7.62mm GMPG (TuF, HP 3). 12.7mm HMG (Om1F, HP 8). 7.62mm GMPG (Om2F, HP 3). 40 × 120mm shots (Tu, HP 50). 1,000 × solid 12.7mm HMG shots (Tu, HP 10). 12,000 × 7.62mm shots (Tu, HP 17). Weapon Accessories: Tank gun and turreted 7.62mm GMPG are linked. Anti-blast magazine for 120mm shots (Tu). Full stabilization for tank gun (Tu, HPs 27), 7.62mm GMPG (Tu, HP 1). Instruments and Electronics: Two communicators, medium range (30 mi, Tu, HP 1 each) with scramblers. Light amplification (HP 1). Thermograph with 2 mi. range, scan 13 (Tu, HP 3). Military GPS (HP 2). Laser rangefinder, 5 mi. range (Tu, HP 3). Minicomputer, hardened, dedicated to Targeting program (Tu, HP 7, comp. 2, +2 Gunner skill). Miscellaneous: Fire suppression system (HP 16). Controls: Mechanical. Crew stations: "Driver" runs controls, light amp., one communicator from normal crew station. "Commander" runs GPS, thermograph, other communicator, 12.7mm HMG from normal crew station (Tu). "Gunner" runs 120mm gun, turret 7.62mm GMPG, computer, laser rangefinder from normal crew station (Tu). "Loader" runs 7.62mm GMPG in open mount from normal crew station (Tu). Occupancy: Short. Passengers: None. Crew: Driver, Gunner, Loader, Commander. Loader loads 120mm gun when not firing GMPG. Environmental Systems: NBC Kit for four people (Tu, HP 10, 1 kW). Power: 1,118 kW ruggedized standard gas turbine (HP 200, uses 67.08 gph diesel fuel). Powers all systems. Fuel: Self-sealing 500 gallon tank (HP 125, fire -1). 500 gallons diesel fuel (fire 8). 7.45 hours fuel for power plant. Access, Cargo and Empty Space: 157.88 cf access space. 27 cf cargo space (Bo). 20 cf cargo space (Tu). Empty space (Bo 68.12 cf; Tu 15.328 cf). Volumes: Om1 (1.606 cf). Om 2 (0.352 cf). Tu (400 cf). Body (750 cf). Tr (450 cf). Surface Area: Om1 9, Om2 3, Tu 400, Bo 500, Tr 400. Total area 1,312. Structural area 1,300. Hit Points: Om1 18, Om2 6, Tu 2,400, Tr 1,200 each, Bo 3,000. Structural Options: Heavy compartmentalization for body and turret. Improved suspension. Body Armor: F PD 6, DR 1,680 exp. laminate. R,L,B: PD 4, DR 140 std. laminate. T, U: PD 4, DR 90 std. metal. Turret Armor: F: PD 6, DR 1,500 exp. laminate. R,L: PD 5, DR 200 std. laminate. B: PD 4, DR 200 std. laminate. T: PD 4, DR 120 std. metal. Tracks Armor: PD 4, DR 30 std. metal; tread skirts with extra DR 70 std. metal. Combined armor is PD 4, DR 100 if tread skirts successfully protect, PD 4, DR 30 if they do not. Vision: Poor. Details: Headlights, no windows, hatches instead of doors. Statistics: Empty weight 118,215.9 lbs. Usual payload 1,740 lbs. Loaded weight 125,885.9 lbs. (62.94 tons). Volume 1,601.96 cf. Size modifier +5. Price $2,125,543.30. HT 10. Ground Performance: Speed 55 mph. gAccel 3 mph./s gDecel 20 mph/s. gMR 0.5. gSR 7. Low GP. 2/3 off-road speed. 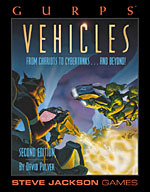 The GM will have to arbitrate the exact effects of spells cast on vehicles. For most Regular spells, it will be important to know how many "hexes" a vehicle takes up. Since a "hex" is a 3' circle, and magical effects are assumed to extend 4 yards (12') up (as per p. M11), each "hex" corresponds to a volume of roughly 85 cf. So to place a regular spell on a vehicle, determine its "size in hexes" by dividing its volume in cf by 85, then multiply the spell's fatigue cost by the quotient. The same multiplier is applied to the energy cost of enchantments. When the cost of a spell or enchantment depends on weight, simply use the vehicle's loaded weight. Example 1: To enchant a 200-cf subcompact car with Walk on Air (500 energy; see p. M35) would cost (200/85) × 500 = 1176 energy. Example 2: To enchant a 500-lb. motorcycle with Invisibility (500 energy per 50 lbs. ; see p. M58) would cost (500/50) × 500 = 5000 energy. 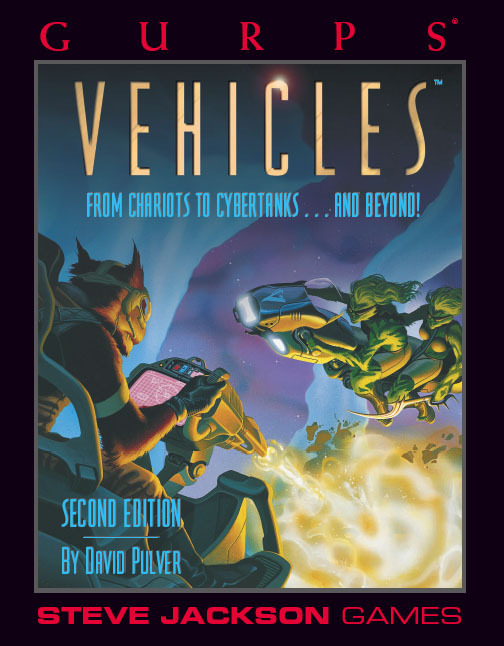 The energy cost to activate a vehicular enchantment is normally paid by the vehicle operator, a Power enchantment or a dedicated Powerstone. Alternatively, the vehicle can be enchanted with Draw Power (p. G101) and powered by conventional power supplies (see p. 201 to convert kWs to fatigue). For armor enchantments, multiply the energy cost by (surface area being armored/25). When cast on vehicle locations with DR 20 or more armor, the Fortify spell will increase DR on a percentage basis instead of adding a flat bonus: 50 energy gives +5%, 200 gives +10%, 800 gives +15%, 3,000 gives +20% and 8,000 gives +25%.